Download Jars' Revenge (PAL/NTSC) in .bin/.crt cartridge format HERE! Download Jars' Revenge (PAL) in .tap tape format HERE! BONUS! Download mp3 recordings of the soundtrack HERE! 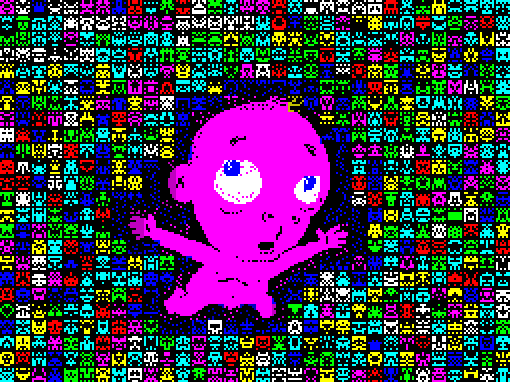 The C64 scene has waited almost 30 years for a decent conversion of Atari's 2600 classic "Yars' Revenge". Thanks to Peiselulli and Linus from Tristar & Red Sector Incorporated, that wait is now over. As it is a remake of an Atari game (with the IP still in use), obviously there is no way that we could get away with officially selling copies of Jars' Revenge here at RGCD. Sorry about that. We have, however, provided the cartridge .rom for free download above - so you are welcome to make your own cartridges or use the file in an emulator. 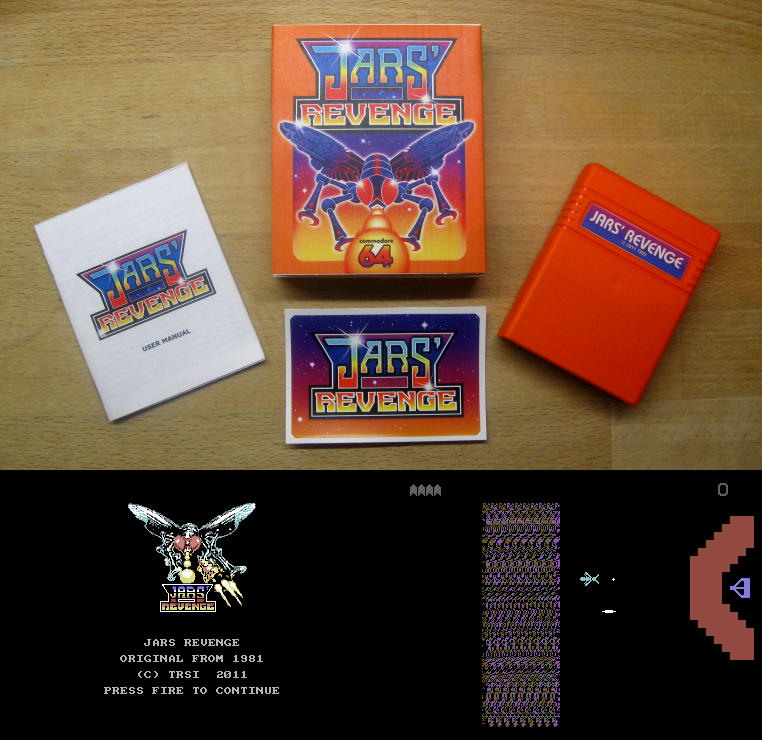 To play Jars' Revenge you will need either a real C64 (and a method of transferring the game over to it) or an emulator. For emulator users, we recommend VICE, as it works on a variety of systems and is very user friendly. Just download the emulator and attach the cartridge images via the 'File -> Attach Cartridge Image' option. Like the original, Jars' Revenge is deceptively complex for a simple looking game; upon it's release last year the most common complaint was that people just didn't understand how to play it! Hopefully the following paragraphs will settle this issue once and for all. JAR - Fly simulator under direct user control. ENERGY MISSILE - Missile shot by Jar, removes cells. QUOTILE BASE - Laser-base like object on right side of the screen, behind the shield. SHIELD - Energy shield protecting the base, composed of cells. CELLS - Elements of which shield is composed. DESTROYER MISSILE - Guided missiles put out by the base to destroy Jars. CANNON - Appears on left side of screen and traverses the screen horizontally. SWIRL - Whirling pinwheel fired by the Quotile base to destroy Jars. NEUTRAL ZONE - Glittering path in the centre of the playfield. When in the zone, a Jar cannot operate fire commands and cannot be harmed by Destroyer Missiles. However, the Jar can still be destroyed by a Swirl in the zone. The primary objective of the game is to break a path through the shield and destroy the Quotile base with a blast from the Cannon. The secondary objective is to score as many points as possible. 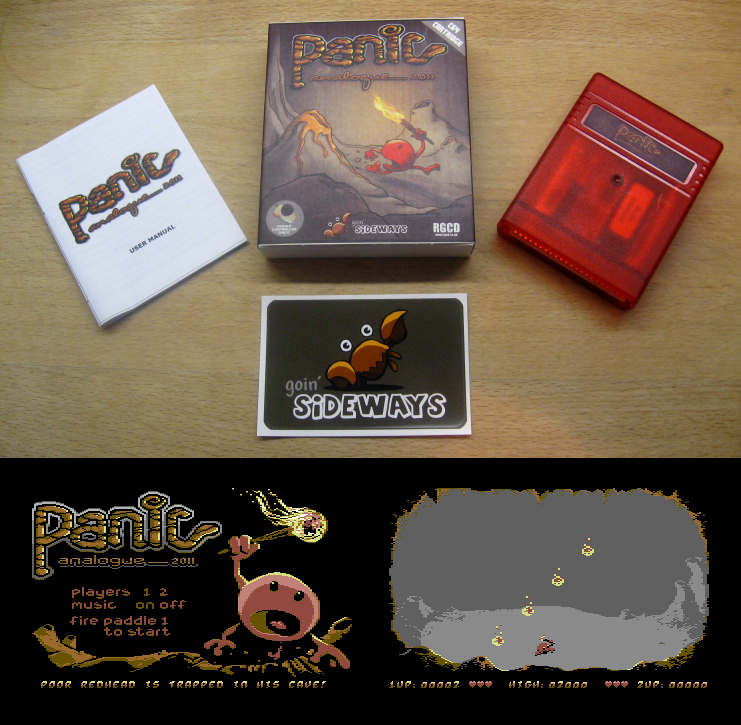 The Jars' movement is controlled by the joystick plugged into port 2. The screen wraps from top to bottom, bottom to top. This means that if you fly the Jar off the top of the screen, it will appear at the bottom, and vice versa. The fire button has two separate firing functions: it will fire an energy missile in the direction the Jar is pointed, or operate the Cannon when it is on the screen. Press SPACEBAR to pause game, use joystick to leave pause mode. Once a path has been cleared through the shield, the Cannon must be used to destroy the base. To call up the Cannon, the Jar can either eat a cell, or run over the base. The Cannon appears on the left side of the playfield, and moves in a direct line with the Jar. This means the Jar is in its line of fire. It is important therefore, to aim the cannon at the base, fire it, and fly out of the way fast! The base shoots off two weapons: Destroyer Missiles and Swirls. The Destroyer Missiles home in on the Jar and the player must do his best to dodge them. Periodically, the base transforms into a Swirl. This Swirl winds up and rushes off after the Jar. A Swirl can be destroyed with the Cannon by hitting it either at its base location, or in mid-air. As a player's score increases, the Swirl becomes increasingly dangerous. The glittering path down the centre of the screen is the Neutral Zone. This area will protect a Jar from Destroyer Missiles but not from Swirls. 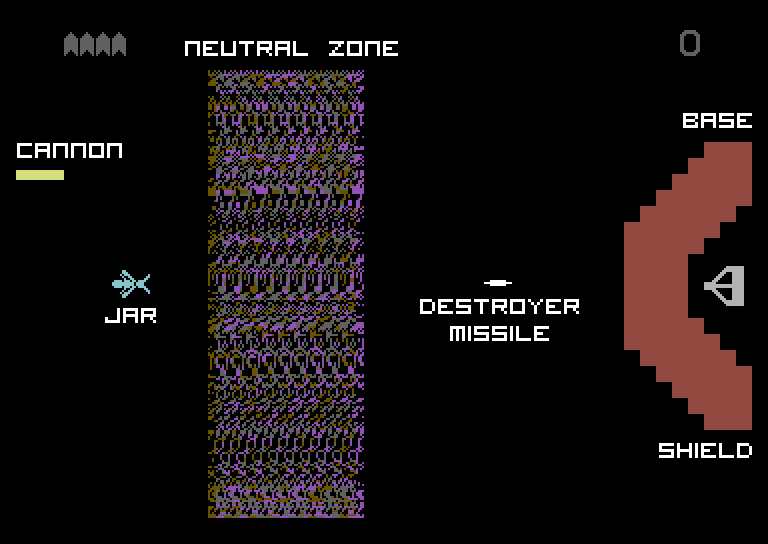 While in the Neutral Zone, a Jar cannot fire any energy missiles of his own. When a Jar is hit by a Destroyer Missile, a Swirl, or his own Cannon, he dies. Each player has four Jars (turns) to play in a game. Additional Jars can be earned (details below). Points and bonuses are rewarded to the player for the following activities. 70,000 Pts - Swirl triples in frequency and sometimes fires instantly. Neutral Zone vanishes on every 4th level. Shield turns blue. 150,000 Pts - Swirl returns to normal frequency but will also change direction in mid-air to hit you. Shield turns grey. 230,000 Pts - Swirl again triples in frequency and sometimes fires instantly. Shield turns pink. 300,000 Pts - Shield moves two times faster. Shield turns brown. 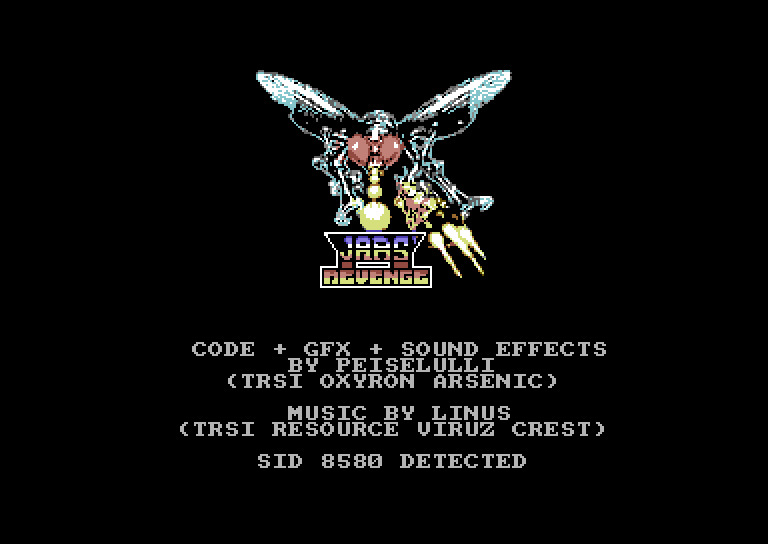 Below is a promotional video of Jars' Revenge running on a C64c with 8050 SID chip. 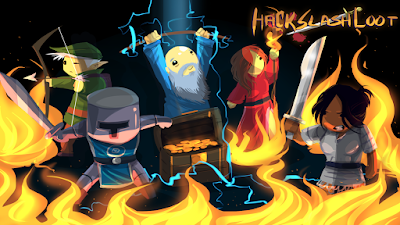 If people want a high-quality downloadable version of this I can upload it to the server upon request. When you destroy the base, or a Swirl, there will be an explosion, during which the Jar stays on the screen. Use this opportunity to make up your own victory dance. The base continually changes colours. The colour sequence is your cue to the appearance of a Swirl, and gives you warning to plan your attack and defence. If you fly over the base as it changes to a Swirl it will destroy you, so be careful. Jars' Revenge is a TRSI production, Copyright 2011. One of the first reviews I ever wrote for RGCD, back when the magazine still came out on a compact disc, was of an MSX game - and for a while now I've been eager to get back to the old MSX, while continously kicking myself for passing up the chance to pick one up at a car boot sale a few years ago. With the judging of the MSXDev 2011 game development contest going on right now and games already entered for the 2012 contest it's looking like a bumper season for MSX gamers and reviewers, and I was chuffed to fire up the top notch blueMSX emulator and have a crack at Zombie Incident, one of the nine entries in the 2011 contest. 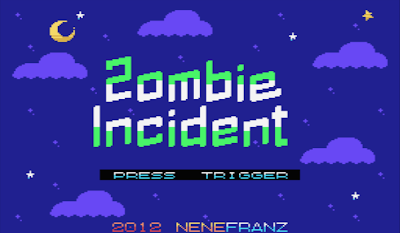 Inspired by the Mojon Twins' Cheril Perils, nenefranz’s Zombie Incident is a screen-by-screen platformer that pits the player against a castle full of zombies of varying species, on a quest to collect eight stars and escape the castle. And at the finish of an incredibly hectic weekend in this reporter's personal life it's quite simply a treat to play. At first glance Rich Make Game's Pineapple Smash Crew ticks all the right boxes to guarantee an RGCD 5/5 award; excellent nouveau-retro presentation, Commodore Amiga composed chiptune soundtrack, procedurally generated content and balls-to-the-wall fast-paced, intense and explosive arcade gameplay. It's cartoonified representation of the Warhammer 40K tabletop wargame universe (Space Hulk anyone?) 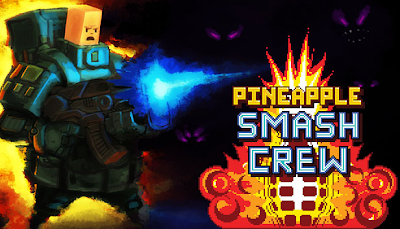 combined with a promise of Cannon Fodder-esque squad-based tactical combat had me hitting that 'buy now' button before even watching the trailer, and my first few plays were a nostalgia-laden and enjoyable voyage of discovery full of eye-popping explosions and some of the most innovative weaponry design I've experienced outside the realm of first-person-shooters. And yet, if I had to summarise the game in a single line my final verdict would have to be "Close, but no cigar". From the outset I should say I really wanted to like Hack Slash Loot more than I end up doing. It is a procedurally generated turn based dungeon crawler/rogue-like, with deliciously retro 8x8 pixel graphics with lovely music. These are factors that are definitely in HSL's favour, and I should be fawning over it and singing its praises – but unfortunately I have mainly been frustrated rather than entertained... and therein lies a problem. It is always fascinating to see art in its developmental stages – bootlegs of The Beatles demos, DaVinci's Last Supper sketches or Oliver Hardy's pre-Laurel short films. 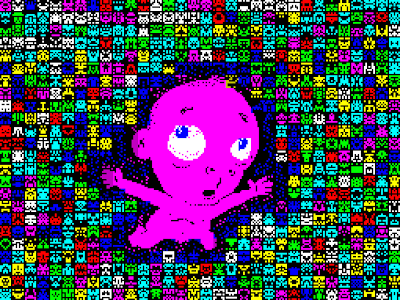 With this in mind it is interesting to note that with EFMB: Endless Forms Most Beautiful we can trace a parentage that stretches back to 2010, a Philatelists Odyssey – Dave Hughes's entry in the 2010 comp.sys.sinclair Crap Game Competition. This was an unplayably slow BASIC game, and begat his much better game Stamp Quest in 2011. Dave has further refined his programming skills (in very public view on the W.O.S. developers forums) and has now given us a new year's present of EFMB – and a corker of a game it is too!